Time lapse fast motion shot of wispy white clouds passing over Cathedral Rock in Sedona Arizona. White puffy clouds cast moving shadows on the colorful red rock formation below. hd00:14Cathedral Rock reflecting in Oak Creek tilt up to Cathedral Rock itself; Sedona, Arizona. hd00:14SEDONA, AZ/USA: August 14, 2014- A majestic red hued rocky ridge towers over the pine tree forest in Boynton Canyon circa 2014 in Sedona. hd00:10SEDONA, AZ/USA: August 14, 2014- The shadow of clouds on a red hued rocky ridge or canyon wall in Boynton Canyon circa 2014 in Sedona. 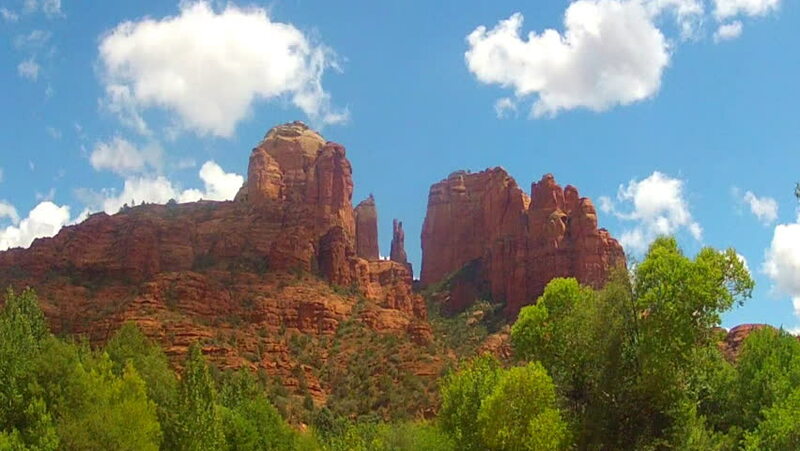 hd00:14SEDONA, ARIZONA/USA- The point of view or viewpoint of a hiker walking toward Cathedral Rock. hd00:10SEDONA, AZ/USA: August 14, 2014- A red rock promontory mountain or butte juts skyward in Boynton Canyon circa 2014 in Sedona. hd00:10SEDONA, AZ/USA: August 14, 2014- A low angle view of a red hued rocky peak jutting skyward in Boynton Canyon circa 2014 in Sedona.